While folks are waiting for me to post my story, there were a number of great photographers out there that were taking pictures and a few magazines that wanted to publish a story on me. These are all listed below. I hope you enjoy the articles and the photos. My recovery week was filled with gaining 10 lbs via 8 pints of ice cream, 40-50 bags of assorted chips, 2 lbs of Twizzlers, 1 lb of peanut butter filled pretzels, 1/2 lb of Cheese Balls and my regular breakfast, lunch and dinners. So I like to eat! That may have been what got me through RAAM. At any rate, I'm working on my story, but it will have to wait for some crew feedback. As you may or may not know the rider is totally oblivious to what transpires during the race. My only mission was to stay on the bike and pedal. Compared to what the crew had to deal with, I think I had the easier of the tasks at hand. I've had time to read through the blog and digest all of the comments. I am overwhelmed with the number of you that took the time to send your comments and positive energy. It truly helped me get through my toughest moments for which I can not thank you all enough. Life is back to normal starting tomorrow, but life does not end. I will continue to dream and continue to live life to its fullest. Keep in touch and I hope to share my stories with you soon. A BIG THANKS to everyone for all of your support and positive thoughts in helping me get across the country. While passing through Littlestown, PA I had the honor of meeting a Ms Rhea Gingrow. It just so happened that I needed a fuel stop right in front of her house. I asked her permission to use her steps as my dining chair to which she obliged. After a few spoons of my chicken noodle soup, I turned to ask Ms Gingrow if she would mind having her picture taken with me, to which she also obliged. During our photo session we learned that Ms Gingrow recently lost her husband, Bill, of 63 years and simply enjoyed observing life from her porch. At the moment she was waiting for her nephew to pick her up for a lunch date. But she told us that we were welcome to stay as long as we wished. I would later learn from her nephew, Terry Gingrow, that we were the talk of the afternoon. Ms Rhea Gingrow was very interested in my quest to race across America and be an official finisher. 11 days, 1 hour and 13 minutes is what it took and I still had time to enjoy a pleasant conversation with a very special woman from Littlestown, PA.
We love you Ms Rhea! Stay sweet and kind and take care of your back. And keep cheering on the cyclists passing through Littlestown. Hope to see you again! Me and Ms Rhea Gingrow. Photo by Mary Delaney. Randy and Crew are trying to catch up on much missing sleep, in part because of nights like these. and Meetings with old friends. That is Randy's official time as announced at the finish line. But that is not the true measure of the experience. It will takes days or weeks for the meaning of what Randy and the Crew accomplished to become clear to them, Right now they are experiencing a very tired euphoria. I can say that of all the riders and teams that crossed the finish line while I was in Annapolis, Randy had the largest cheering section by far. I submit that that is a measure of the affection those cheering feel for Randy. I took it into my head to go to TS 52, to see Randy into and out of the TS. This TS is the one where teams and riders have to wait out any penalties they might have accrued. Since both my daughter and Elaine wanted to see Randy, we all got up early. With trusty GPS suctioned to the windshield we set off for the drive to Mt Airy. After a false start, we were moving right along on roads that were happily free of traffic (compared to normal anyway). 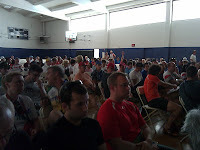 We arrived at the Mt Airy TS with about 15 minutes to spare according to the estimated arrival time on the RAAM web site a/o last night. We saw the team from Bulgaria, tried to chat and discovered they did not speak much English. One of them took a lot of pictures of Jure Robic's bike that was on display along with one of his jerseys. Then my daughter got sick and we had to take her home. As it turns out, Randy slept in a bit this AM, so I'll be headed out a bit later to try again. If that doesn't work, I'll head for Annapolis. Hope to see some of you out there. I got a text from Earl saying that Randy is now in Maryland. He has passed passed TS 48 in Cumberland MD. "After a later start (5 am) and a morning nap yesterday, early in the ride, Randy found his rhythm and cycled steadily through the day. He pushed on to Ellensboro, WV, arriving at about 10:30 pm. The tailwinds continued. He got a few light sprinkles. He continued to befuddle the teams who seemed to only be able to shake him with real effort or if he let them go by. A new technique is being attempted to keep him awake in the morning part of the ride. Peppermint oil has been applied to his glove and he has been instructed to sniff deeply if he seems to be nodding off. We will also attempt to flatten out his calorie intake. He gets hungry, wolfs down 1000 calories and a half hour later wants to sleep. If sleep is denied or delayed, he starts nodding off on the bike. We continue to be near the Irish rider, Donncha. He was the rider who offered his crew's assistance when Randy was first struggling with Shermer's symptoms. He is the rider we see the most and we are nearly always parked near his crew. Randy pushed off between 3:30 & 4:00 am this morning, later than he wanted to because of the need to clarify conflicting route changes. Today's plan is to ride from time station to time station, getting as far as is reasonable. The Appalachians are a challenge, but this is familiar ground for this strong climber. It was simply amazing watching Randy move steadily uphill yesterday afternoon. A surprise is planned for Cumberland today. I hope he makes it there reasonably early, because he could get quite a boost. The Crew is getting anxious to get to Annapolis. The goal is now Sunday. We keep hearing stories about intense crew conflict, but we remain focused on Randy and doing all we can to support his ride. Next time station is Grafton, WV where I've parked the RV waiting for his arrival." Randy is now in West Virginia. "He (Randy) challenged some team riders, keeping up with them or passing them. Many riders can't believe this unknown guy with a big chin support can keep up with them, let alone out climb them on the hills. Many riders can't believe this unknown guy with a big chin support can keep up with them, let alone out climb them on the hills." Once he gets to TS 45 in Ellenboro, WV, Randy will have *less* than 400 miles to go! 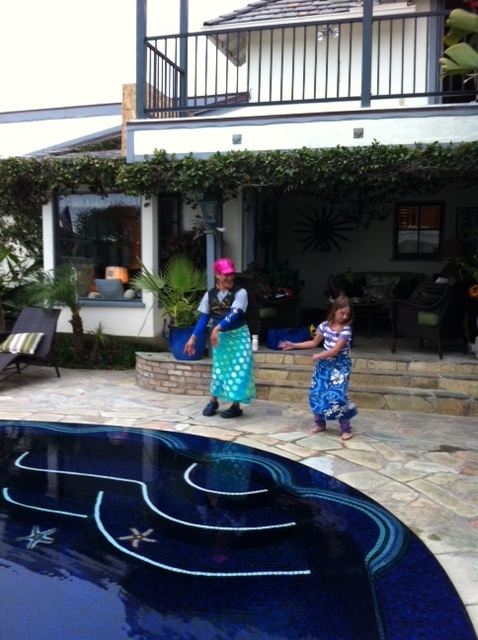 Mary (still in safety vest) and Connie do the laundry. Just one of the many "invisible" jobs that need to be done to get Randy across the country. And you meet interesting people crossing the country this way. Meet the Browns, Biddle and Betsy Brown. They are mountain bike riders who travel to trails in their RV. Biddle is 86 and Betsy is 84. 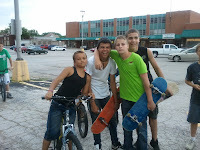 Hope I'm still riding when I'm their age. This post is stitched together from email and texts I got from the crew today. Duct tape bandage and good to go! "Yesterday, Thursday, was a hard day for Randy. He got into Oxford Ohio after 1 am. If we get off before 5 I will be surprised. There is a mist in the air. The goal for the day is Grafton, WV. He sounds better than yesterday morning, with more energy. We are hoping Randy digs deep Right now, a Sunday arrival is looking most likely." "We got off at 5 am exactly!" "Randy rolled into Time Station 42 at about 8:20 and lingered a lot longer than we wanted him to. He and the other solo riders we encounter are very tired. We are once again trying to find the right combination of rest, nutrition, & hydration to keep him going. Even though he is tired, he is in good spirits." "He's looking good w/smooth cadence, but he's tired. Doing his best to stay awake and alert. Stopped at TS 42 for some hot cocoa and a Starbuck's double shot super duper caffeine beverage. The TS volunteers are amazing! Captain Amy and John McFaddin of Blanchester, OH are covering two TSs. Their family is there and are providing wonderful support to the riders and crew! Can't thank them and all the volunteers enough. They are doing a terrific job. Tim and I are on support and are helping out with some tricky turns this morning. We left TS 42 at 0900. We're geting.there! Randy continues to click off the miles as Time Stations 39, Bloomington, IN and 40, Greensburg, IN fall into his wake. "While we were getting Randy ready for his last time stations of the day, a small group of boys gathered outside the RV to meet the man riding his bike across the country! They were all polite and patient, and had many questions? Does he ride in the rain? How many miles a day does he ride? Where's Annapolis, Md.? All the boys are from Alton and some got autographs. Randy said it made his day! We hope at least one of them completes RAAM someday! Who will it be?" According to Susie their names are: "Trevor, Adam, Algernon, Bobby Smith, Alex, Stephane, G-rod, TT All Day"
Rich adds "The autograph hounds were in Greenville, IL. All were amazed at what Randy is attempting to do. 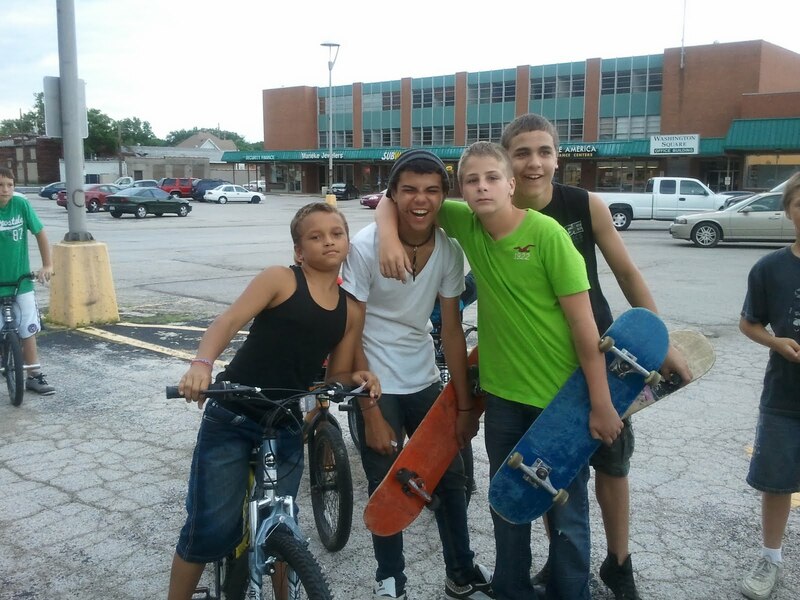 They wanted to follow him down the street, but we told them it would be too dangerous." The TS referred to below are 37, Effingham, IL, and 38, Sullivan, IN. States keep clicking by. That was a nice night's sleep. Randy rode 2 time stations after a rest following the crossing of the Mississippi River. He rode well, strong, and quick. His social personality is continually coming out. Some are treating this as a race, he is treating it more like a brevet. Reportedly he had a good time with a 4 person team last night. When they changed riders, he would stop to talk to the rider that just finished his leg. Then he would catch up to the team rider, and continue the process. Long report focused on Randy's Shermer's Neck symptoms and treatment. The occurrence of Shermer’s Neck is one of the ultra-endurance cyclist’s most feared problems. The onset can be very quick. The only commonly reported prodromal symptoms (warning symptoms) are tightness and discomfort in the upper trapezius, and erector muscles of the cervical spine. This leads, after a variable period of time, to rapidly progressive loss of the ability to extend the neck, and to neck and upper back pain. There were a number of periods with higher winds, and also some very long descents where Randy spent many hours in the aero position prior to this. Our experience indicates that riding in the aero position may hasten the onset of Schermer’s Neck. 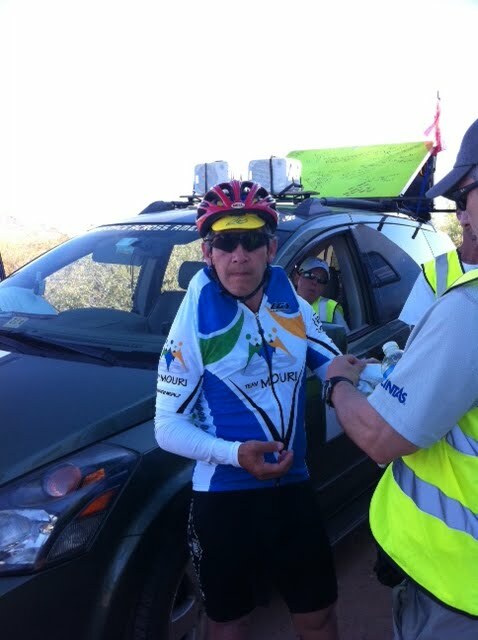 Randy began to have prodromal symptoms by about 600-650 miles into RAAM. He complained only once or twice of upper back and neck pain before abruptly realizing that he could not extend his neck to see, nor could he properly position his head when he attempted to climb in the standing position shortly before coming into Durango, CO. We deployed an adjustable Laerdal Cervical Collar as immediate first aid. For the reader who experiences Schermer’s and attempts to use a cervical collar, you should know that this solution is very confining and uncomfortable. Also, the collar completely prevents neck rotation as they are designed to protect a broken cervical spine. Thus, with the collar on, Randy could no longer rotate his head at all to see to the side or behind him. He was, however, able to ride on while we addressed the issue. When Rehab to Racing signed on to provide sports medical and physical therapy support for Team Mouri, Mary and I began to study the range of reported medical and physical problems. First, there is almost no scientific literature on this group of athletes. There are a few antidotal reports; mostly case reports and letters to the editor. The ultra-cycling blogosphere is replete with what from a scientific point of view are wildly variant statements of the origin, treatment, and prevention of Schermer’s Neck. These are often stated with certainty and conviction. We could find no single instance of a statistically valid survey or scientific study of the causation or treatment of Schermer’s Neck. There are a number of theories of the causation of Schermer’s. These range from “Spinal mis-alignment”, to sternocleidomastoid muscle spasm, to weakness of neck muscles in general, to sequelae of prior neck injuries. Treatment recommendations are even vaguer. There are only two reports in the literature of physical examinations by medical experts of Shermer’s victims immediately after onset. One common thread seems to be the once Schermer’s occurs on an ultra ride, then the rider is stuck with the problem until they can rest (off the bike) for at least 24-48 hours. Randy has a past history of Schermer’s, which occurred after about 600 miles during the Paris Brest Paris Brevet ride. We examined Randy with acute onset Schermer’s. First, there was no evident active sternocleidomastoid muscle spasm at all. Both were tender to deep palpation. Maximal discomfort on examination occurred in the upper trapezius, and the cervical erector spinae muscles. There were several trigger points in this area. Motor exam revealed that Randy had near complete inability to extend his neck against gravity. Attempting to do so caused posterior muscle pain in the previously mentioned muscle groups. Thus the current R2R theory of Schermers causation is that these muscle groups have simply been exercised to failure. Failure onset is accelerated by fatigue induced muscle spasm. This theory is strongly supported at present by Randy’s response to subsequent treatment. 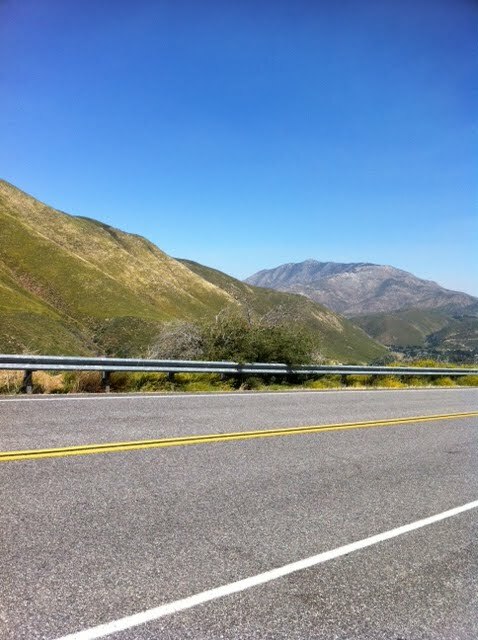 At present we are 1800 miles into RAAM 2011. Randy is not using a collar at all. Randy can extend, and rotate his neck with only minimal discomfort. He has had no analgesics at all except 2 ibuprofen 200 mg tabs when the problem first started what seems like days ago. He rides about 20-30% of the time in the modified aero position with our McGivered chin support. We changed out his stem, raising the handle bars approx. 5 cm. 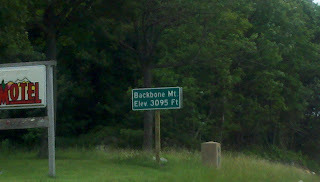 Additional therapy based on preventing/treating muscle spasm, while using the chin rest to give intermittent rest to the neck extensor muscles, has resulted in progressive resolution of Randy’s Schermer’s symptoms while at the same time he has had three back to back 300+ mile days through all of Colorado, and Kansas. Chemically, we have markedly increased Randy’s [Mg] and [K] intake. Also, we immediately started the muscle relaxant methocarbamol 750 mg TID. Potassium intake has also been increased by feeding potassium rich foods. Immediately at onset, our expert Massage Therapist, Connie Griffith massaged his beck extensor muscles and upper trapezius. She has helped all follow vehicle staff learn to massage the neck extensors at every single stop. Randy’s neck continued to improve at this point. Long report has been divided into two parts. This part is a followup to the prior medical report. Follow-up on prior medical issues: Our crew member with acute lyme disease has responded to antibiotic therapy for a week. We have one crew member on topical Voltaren Gel for acute ankle tendonitis. Randy’s Arse: with a saddle change, rigorous attention to changing shorts frequently, frequent cleaning, and use of high Vitamin E cream in addition to regular chamois cream has actually allowed his worst areas to heal a bit, and he has had some decrease in symptoms. Raising the saddle nose has distributed more weight forward to the anterior perineum, he now has a larger area that is slightly irritated, but the severely affected areas are much smaller at present. Randy has had some median nerve compression symptoms in both hands. These symptoms have decreased since he has had his chin rest installed, as he now is able to resume using the aero position. He has symptoms of numbness with a normal motor and sensory neurological exam of both hands. Randy has had no cramps at all in his legs after day 1. Significantly increasing sodium, magnesium, and potassium intake has kept that problem from recurring over 1800 miles. At least once a day we have used an ice bath to the waist during a rest stop, and leg massage of major muscle groups at least twice a day for 15-30 minutes. "Randy took another rest break in Alton, and gradually a dozen local kids gathered, asked a ton of questions, and waited around (up to an hour) to get Randy's autograph. He signed cards and skateboards. Randy described this as the highlight of his day. We promised photos posted on the blog. 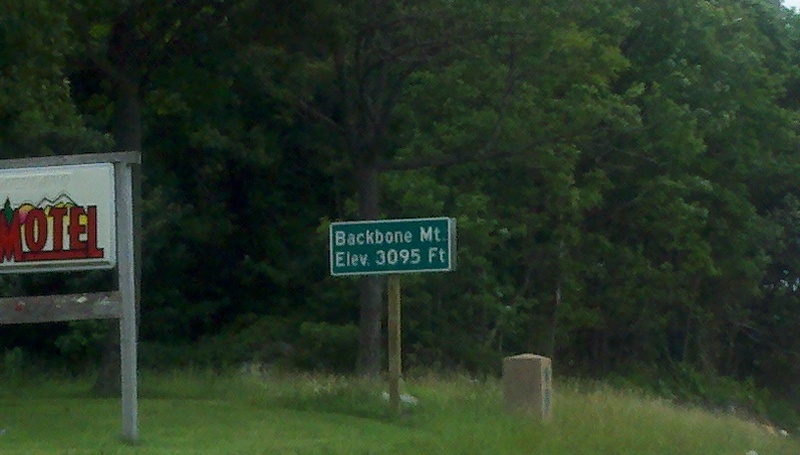 The plan is at least another 50 miles, and probably 100. It started to sprinkle as he pushed off." Randy has crossed the Mississippi River at TS 35. More to follow. UPDATE from Crew: ""Randy is now resting. A pattern has emerged the past 3 days. Randy rides 150 miles, gets so tired he is falling asleep on the bike so he goes down for a nap. After the nap he is on the bike for up to 200 more miles. We have 20 more miles to the shuttle across the Mississippi (route detours have required this change), then 10 miles to the Time Station. The average speed will jump because of the 20 minute car ride." UPDATE 2 from Crew: "What a mess! Heavy urban traffic. Incomplete and complicated detours. Road construction. No miscues but lots of delays and the Itallian spies were funny Randy did ride his bike over the Mississippi River after all. He made the time cut off. Regrouping to see what is next. Now ridden 2030 miles!" Randy took a break for Ice Cream. According to Steph "Randy's a happy boy!" Sleeping were you can with safety vest (Not wearing vest is a penalty). 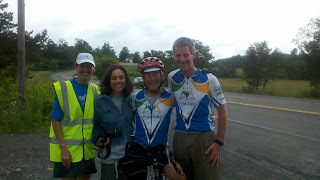 The Ulysses News sent a reporter/photographer out to cover the RAAM. They were kind enough to send these pictures of the Crew cheering Randy on and Randy's reaction. Click on the photos to get a better look at the chin rest on Randy's bike. And his smile. 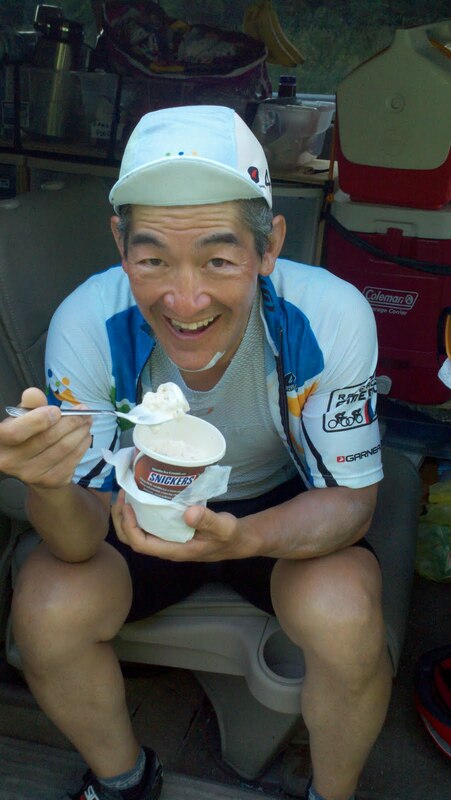 A comment we received from someone who crewed on a previous RAAM (I can't find the comment or I'd use your name), recommended that we be proactive in relieving Randy's neck of the tension it has been under for the last 1500 miles or so. What the crew came up with is shown in the picture to the left. (Click to enlarge). While I have no reports of Randy having Shermer's, we hope that giving him a way to rest his neck while he rides will put Shermer's off as long as possible. Communications between the road-going Team and the stationary part are sometimes a bit erratic. As a result, I now have a bunch of late arriving photos. Although they fall out of order with what is happening on the road, I thought you'd like to see them anyway. Can you find Team Mouri? And this is what Randy and the Follow Van look like moving down the road. I'm not sure where this shot was taken, so I'm guessing Colorado. From Earl: "We are not in Kansas any more. Day's goal = 319 miles. 100 to go!" Randy passed TS 31 Weaubleau, MO at 1927 today. 1772 miles from start and 1217 miles to finish. Randy just passed TS 26. Only 21.3 mile to the halfway mark!! The photo is of Sunday's sunset along the race route. Crew: "Randy just blew through TS 25." Time Station 25 is in Greeensburg, KS. 1440 miles done, 1550 miles to go! Current route is along US 54. There will be some deviation as the course loops around the north of Witchita. This has been quite a day for Team Mouri. I have limited time so I'll just give bulleted comments. * Randy was feeling stronger and decided to start an hour earlier than planned. It caught the crew off guard and resulted in sleep to on the road in 15 minutes, and still Randy was waiting. 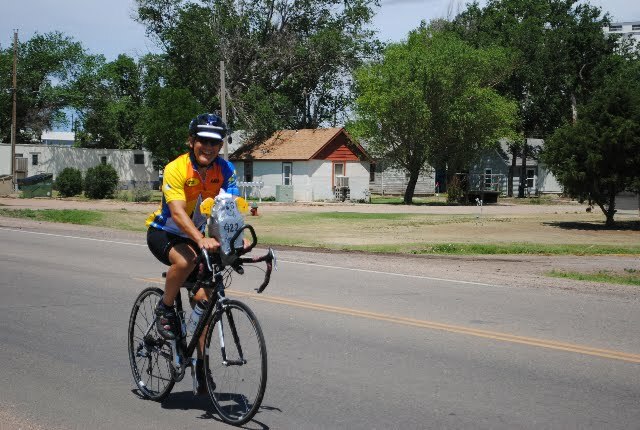 * Randy and the other riders are taking advantage of 25-30 mph westerly winds, riding as long and hard as they can. * Randy and 1-2 other riders were caught in a huge thunderstorm and marble sized hail (4-6 miles of hail). His helmet has hail dents and one caught the side of his eye causing a bleed in the white part of his eye. He was chilled to the bone, but we were able to re-warm him and get him going again relatively quickly. * Randy has been strong today. His goal before he stops is the halfway point of the race. He is attempting to make up for some of the 149 mile day yesterday (or thereabouts). Days no longer have meaning. We measure time by time stations and shift changes. That's the important news. Now off to TS 26, a short run. 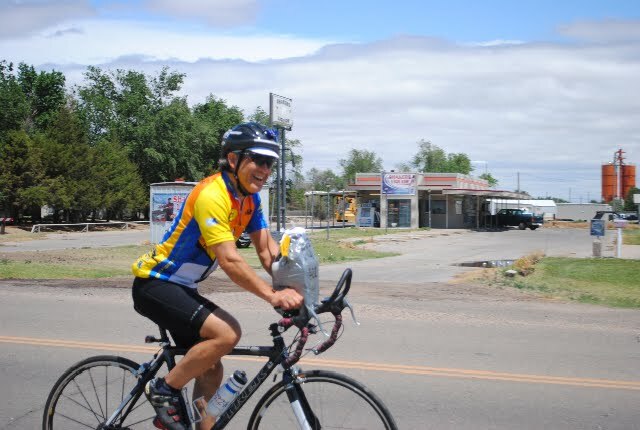 As of TS 24, Randy has ridden 1374 miles and is closing in on the half-way point. And yes, your comments and encouragement are important. The Crew reads them to Randy to help motivate him to keep spinning. So please keep them coming. 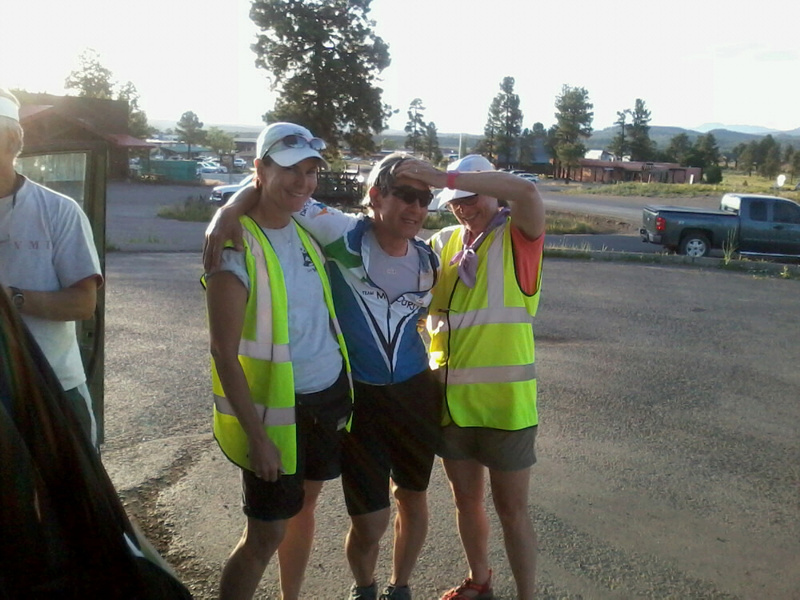 Randy reached Time Station 20 in Trinidad, CO at 2115. Randy has now covered 1130miles. Only 1860 to go. The picture is of the RV is which Randy is probably resting as I type. Randy got to the top of Wolf Creek Pass just after midnight. Randy stopped and took a nap at near the crest of the cold (36 degrees) pass before doing the chilly (40s) and very fast descent. Addendum: Found a site which has a lot of info on US 160 that Randy is riding. "Well we made the cutoff with time to spare. Randy has been a little tired of late. Coming into DURANGO his neck started to bother him. So we now have Connie staying in follow and Al in support so we can treat often as necessary. Behave him in a neck brace. Randy wasn't happy with his climbing bike saddle so we got another one to try. crew is being well fed and we are holding together and remaining flexible." 53 miles away. Beautiful puffy clouds, sunny and 77 degrees, with a tail wind. This is a perfect change from yesterday at this time when the thermometer reading 112 degrees and not a cloud in sight! We were crossing the desert from Parker, AZ to Prescott, AZ and that was not the max temp. That was to be 114 degrees! Oh, but wait…the locals say, “It isn’t that hot, because it is a dry heat.” Righto, just like an oven or a kiln! I can tell you it was as hot as hell! 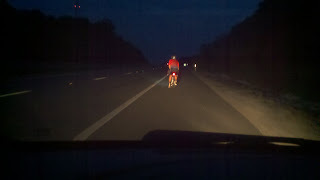 The challenge was to keep Randy cool enough that he could ride safely and make some progress toward Annapolis. We found ouT later that many of the riders had been pulled by their crew and were resting during the heat. We pressed on, exchanging fluid bottles every 5-10 minutes, as Randy drank and drank. We made “ice socks” with a plastic bag full of ice stuffed into a tube sock and draped them around his neck, tucked into his jersey. Those had to be exchanged about every 20 minutes, as they melted. About mid-day our 3 vehicles met up under a “tree” and Randy went to the RV for a rest and a massage. First he was weighed. It is essential to monitor his weight to be confident he is hydrating well. We expect some weight loss but he was 7# down. No more suggestions about hydration and start being forceful. This very tired biker stripped off his wet clothes and laid down. Connie, our massage therapist, started working his leg muscles and he fell fast asleep. We allowed him to sleep for about 90 minutes, woke him and chef Troy fed him a grilled turkey sandwich with hummus and an Ensure Plus. Randy wore a light jersey, a light skull cap, white arm covers and white gloves and lots of SPF 70 sun blocker, applied several times. He struggled to take in calories, as it is hard when it is so hot. So, we started giving him dilute iced chicken broth with Lava Salts poured into each bottle for the sodium and a few calories and the ice. He loved it and quickly downed about 4 bottles. He ate some red Twizzlers licorice, some Pringles, Ensure Plus, a dilute cola and Mountain Dew. You note that his nutrition sounds unorthodox. But, after 24 hours, the gels, manufactured energy foods are nearly inedible. The palate tires and the stomach revolts. We have fed him cheeseburgers, pancakes with syrup and butter, shrimp salad, V8 juice and every other thing that sounds good to him. Randy ended up riding about 20 hours this day. 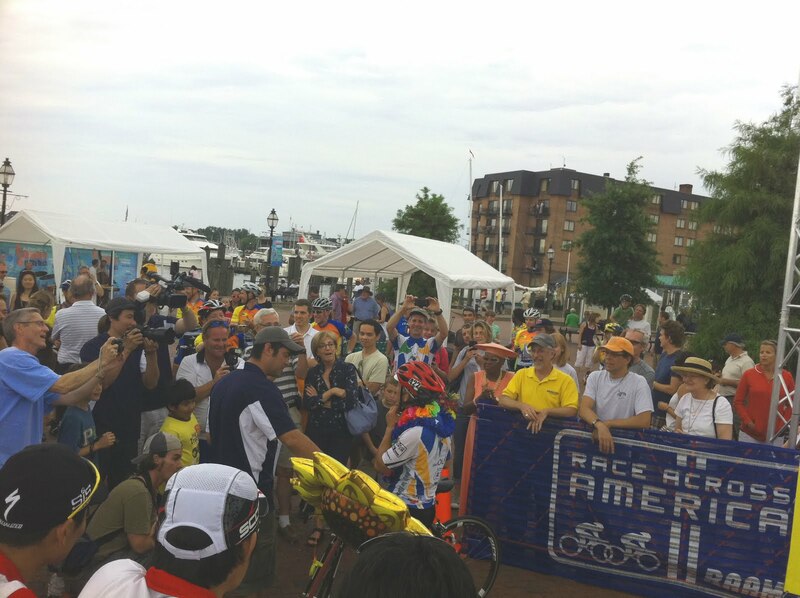 He is on track for a solid finish in Annapolis. And although we are leaving the desert, we still have the mountains of Colorado, the heat and endless prairie land of the Midwest, and finally, the Appalachians. LONG POST - Update on Randy condition from a medical perspective from the Team MD. We survived the desert of day 2 with temps up to 114⁰. Randy required continuous cooling w/ice to make it across. We used “insulated” Water bottles, 1 with iced water to wet himself with. The second bottle was for Randy’s drink. The relevant temperature management strategy was to change bottles every 15 mins with one ice cold, just half full. Another component was a plastic bag lined ice sock around his neck, tucked under his jersey, and changed every 30. Going into that day from a medical perspective, Randy still did not have sufficient internal sodium and magnesium stores to allow good endurance in that oven going to Congress, CA. We even dissolved 1 Lava Salt tab in each of multiple doses of ice cold chicken broth which he drank like it was cold beer during the ride the day before, and with all of the different methods of administration, he received 9000 mg of various sodium salts, and 6.5 gms of magnesium sulfate in less than 24 hours. The use of white sun shield arm covers, kept continuously wet along with his head sweat and upper jersey in the <15% relative humidity allowed sufficient evaporative heat loss due to rapid evaporation to allow him to ride throughout the day. Whew, I don’t know whether he or the vehicle air conditioners were working harder. A few doses of SPF 70 sun screen got the whole Team through with no serious sunburn. As we rode thru the night of day 1, and thru day two, Randy’s fluid status improved, and the impressive net weight losses (up to ½ lb per hour riding) we observed during the first 24 hrs begin to abate. His ability to tolerate street food improved. All readers should note that when a rider is going hard in 110⁰F+ temps, they do not tolerate ANYTHING solid, chocolate, or really sweet tasting, and are generally limited to about 200-250 kcal per hour intake. Without this nutrition and enough high salt fluids, they will eventually just fall off their bike. This finding is consistent with experience in much shorter events such as a hot IM race or International Long Distance Triathlon Championship event. My opinion about the physiology is that under such extreme stress such as the Desert, the stomach requires VERY simple things to allow continued function. Isosmolar fluid intake only, simple sugars, nil fat, no protein, just amino acids. The issue of the next several days: THE ARSE. Almost all distance riders experience at least some perineal discomfort on longer, and especially multiday rides. RAAM lore is replete with tales of unimaginable misery due to perineal breakdown, and resultant almost unbearable discomfort. Randy had previously experienced prolonged perineal folliculitis in the anterior perineal region on more than one occasion. This responded very nicely to the appropriate antibiotic ointment in March. Prior to this he had tried several therapies, had recurrence with each return to increased saddle time, and was at least very frustrated. His posterior region pre-race was pristine, but by about 14 hrs or so in the saddle, the areas over his sit (ischial) bones on both sides were red and getting sore. We increased lube and began increasing the frequency of changes to fresh cycling shorts, and applying hi Vit E cream to the area in addition to his chamois cream. By 40 hrs in the saddle, we clearly were not winning the battle, but skin breakdown was not imminent. As his weight with each stop was stabilizing, indicating at least temporary continued resolution of our previous fluid and electrolyte battle, a worsening situation in the basement could soon become Randy’s major limiting medical problem. Not that the usual severe sleep deprivation for all concerned is not really a problem, just the normal environment in the game of ultra-endurance multiday cycling. After my 16 hr shift, I tried to get my sleep break started while remaining completely confused as to why the location and nature of Randy’s perineal misery was so completely different than his previous problem……At about 0200 RAAM Race Time, I bolted straight up awake with an “Ah Hah” Moment, only to crack my head on the overhead of our RV. The reason was that Randy lowered the saddle nose weeks ago due to the painful pressure on his anterior perineum due to the chronic infection there…AND it was still down!!!! Damn, I must be getting old! The increased pressure posteriorly simply must be the underlying cause of why the location of the trouble had moved so far in less than 6 weeks. One part of the solution must be to level the saddle…Done at TS 13, saddle back to level, and that should reduce pressure on the sore areas. The saddle sore saga continues, more to follow. Randy has now covered 875 miles passing through the Time Stations at Motezuma Creek, UT, Cortez, CO, and Durango, CO. Randy changed bikes (to climbing bike?) after Cortez on his way to Durango. According to the Crew, Durango was "accomplished with a lot of pain and effort." Randy had to get to Durango within 81 hours. Riders who do not make the time limit are disqualified from the remainder of the race. According to RAAM stats, the highest attrition occurs in the first 1000 miles. If you have been using the RAAM site's Map of Progress feature, you may notice that Randy is headed for the "Four Corners ". This is where Arizona, Colorado, New Mexico, and Utah meet. and is the home of the Navajo Nation and the Ute tribe. Randy is heading into the Four Corners area as he heads for for the next TS in Kayenta, AZ. Just so you know, the Crew does read the blog (correcting my errors) and your comments. Randy gets your comments read to him over the PA system (remember those speakers on the roof of the van?). Your messages of support and encouragement really help him stay motivated. So please keep them coming. Thanks. My apologies for such limited postings today, I was traveling home. So where is Randy? So far, he has passed four Time Stations today (see below). I heard from the Crew that the plan was to press on after Tuba City until the heat got bad. 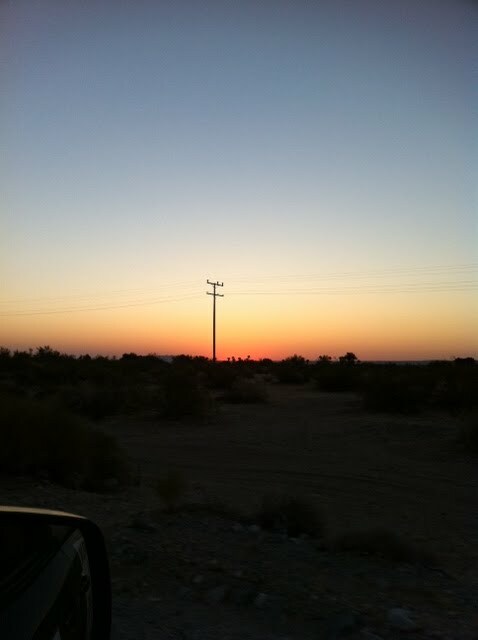 Then sleep (probably in the RV) through the worst of the heat before setting off again..
Thursday sunrise in the desert and Randy during a stop in the desert. Today was a better day although "the desert was brutal". Randy is now climbing out of the desert into cooler temps. He has had a couple of good rest periods and has been able to stay hydrated. The ice vest has not been comfortable, so the ice sock is being used instead. The sun has been intense so what little skin is exposed is saturated with sunscreen. Randy is feeling strong and "continuing on for now". He's going to need to sleep at some point, so I'm hoping he decides to sleep some through the heat of the day. Randy passed TS 3 at 0642 this AM, 235 miles into race, which puts him in Arizona. It's going to be a hot day with expected temps in the 100s. 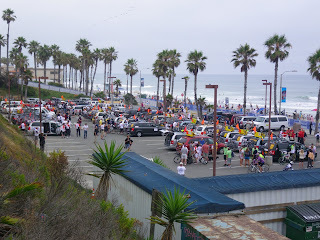 I have another source of status data for you: the official RAAM site has the official (duh) status of each racer. Have a look. Use the drop down box under Race Coverage Navigation to select Randy by (number 422). Once his results page loads, scroll down a bit to see which time stations he has passed, along with mile completed and miles to go. The GPS tracking system I described in an earlier post must be getting quite the workout. While the site shows Randy at mile 47, I received two texts from the Crew that Randy passed Time Station (TS) 2, 145 miles into the course at 0010 this morning. Hopefully, the GPS system will get straightened out so that you can follow Randy in near-real time. P.S. To use the GPS tracking system, click the above link, then select Randy from the list on the right side of the screen. The racers are listed in alphabetical order. 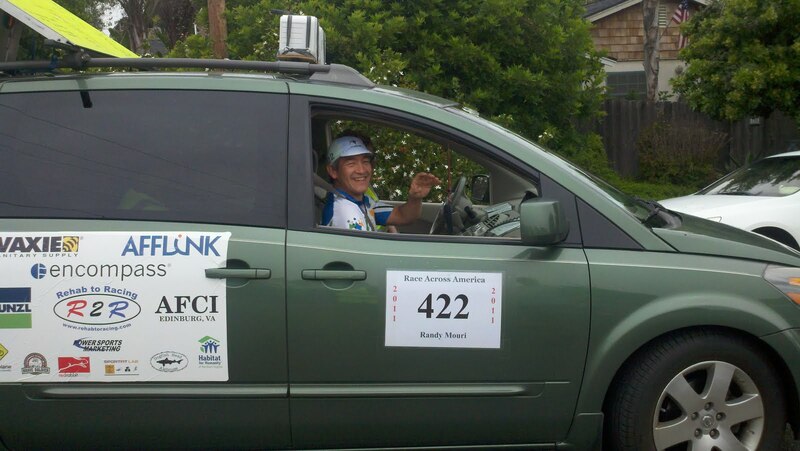 Randy started right at 1530 RAAM time and set off along the parade section to the begining of the unescorted race section. The roads in that section are so narrow that support is not permitted until the roads widen out. The Follow Van and Support Van left after Randy got started and made thier way to the rendezvous. 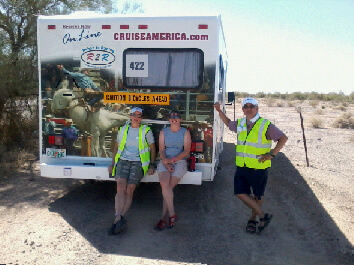 The RV (Crew #2, Earl, Tim, Susie, & Connie) waited out the early part of the ride here at elevation above Borrego Springs. Borrego Springs daytime temperature was 109 and this location was breezy and 81. Much more comfortable for napping. 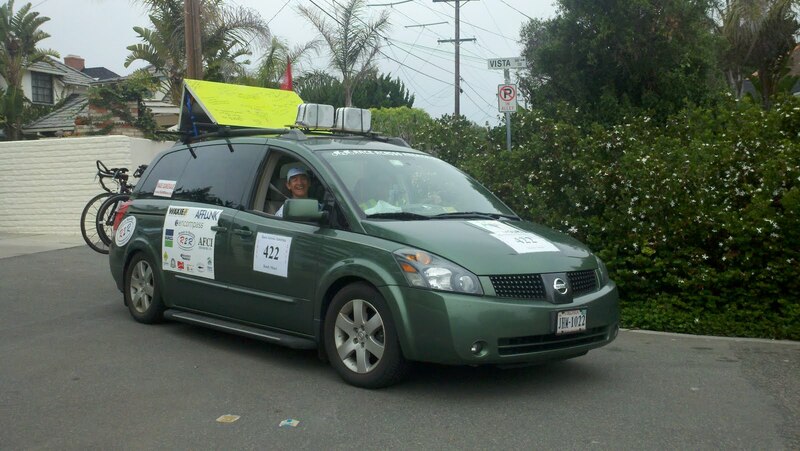 Yesterday Earl and Randy pre-rode the 24 mile parade section of the race. That's the section that gets the racers out of town before the race proper starts. "An easy spin on a pretty day. Earl was practically giddy. Randy was confident." Randy will enter the desert early in the ride. At Borrego Springs the high was 105 yesterday, and expected to go higher today. 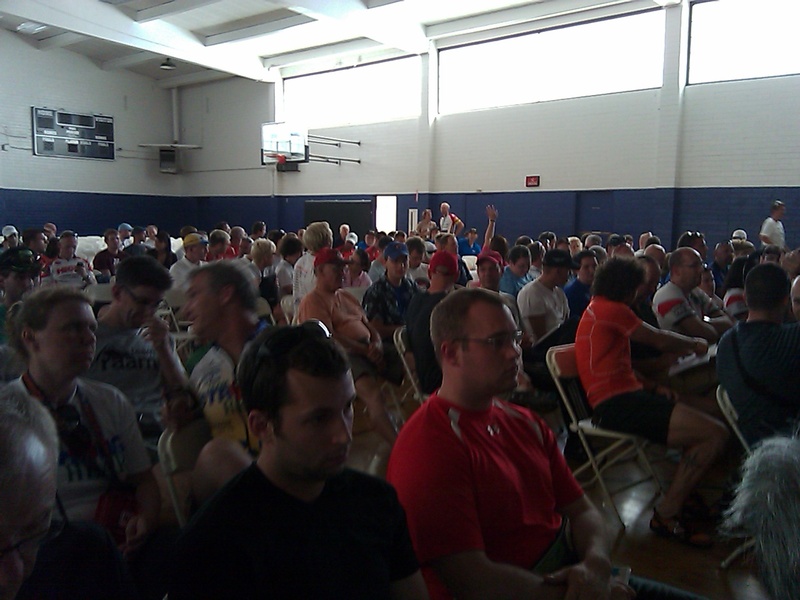 Today RAAM held the mandatory meeting/briefing for Crew Chiefs and their Racers. This meeting goes over last minute changes to route, safety issues, and other matters critical to a safe event. To give you some idea of the scale of this event that is totally unknown to the sporting public, take a look at this picture of the meeting. All the work to get the vehicles and bikes set-up has paid off. I just got a text from Earl saying the support vehicles (Follow Van, Support Van and RV) and Randy's bikes have "passed inspection with flying colors" This is a significant milestone, since failure to pass inspection means the vehicles cannot participate. Bikes that do not pass inspection cannot be ridden. That Team Mouri passed inspection with ease is a testament to everyone's hard work in Virginia and California to be prepared. Now that everyone is in Oceanside, the tempo is picking up. 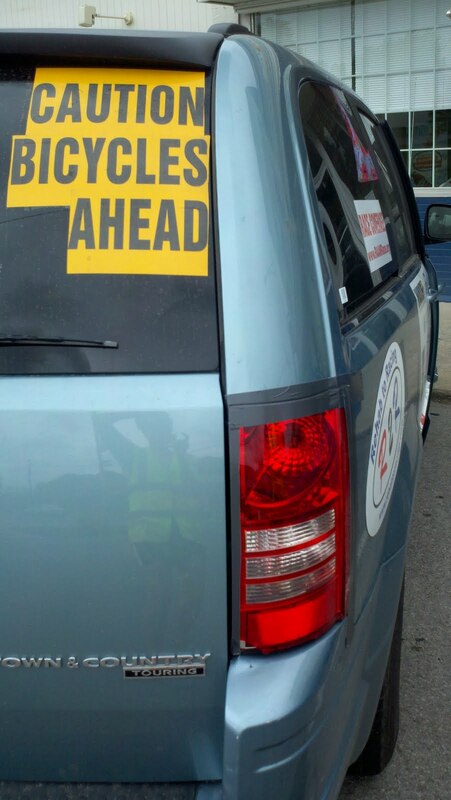 The Follow Van has to be emptied, set-up, repacked, and properly marked. The Support vehicle and RV both need to be set-up and packed.